Credo Reference may be small in stature, but it’s big on ideas. Just ask CEO Mike Sweet, who is busy channeling plenty of new innovation into the library reference arena. Credo has carved a niche for itself as a customizable online reference solution for learners and librarians. Reference represents the library’s first layer of discovery for researchers and academics, says Sweet. And that being the case, Credo is mindful of how librarians need to help researchers in their quest to find relevant information. “We’re building products that satisfy both what librarians want in terms of complexity and what users need in terms of simplicity,” says Sweet. “And it’s quite a challenge.” Armed with nearly 1,200 titles from more than 70 publishers in every major subject, Credo’s business model relies on subscriptions and perpetual purchases to librarians who can mix and match titles to cater to patron needs. It’s a formula that has worked well so far, and Credo is intent on expanding its product line this year, offering more added value for librarians, researchers, and academic users. Credo starts users off on the right track and adds links that cross-reference content across collections, topics, and publishers for the best-of-class contextual results. Sweet sees part of the popularity of Google and Wikipedia as providing a starting point. “They offer the researcher the basic information, a definition, for example,” he says, adding that Credo does that and more. “We’re moving beyond just aggregation and reference,” says Sweet. “A lot of people knew us as a subscription-only reference service. … Now we have added more to the mix with our Subject and Publisher collections and other services.” For example, Credo Topic Pages wrap context and vocabulary around one research subject as a kick-off point. It offers definitions, library resources, and web links on one topic across selected databases and e-resources without hitting any silo walls. It has the ability to drill down into any subject in as much depth as the researcher needs or wants. Another newcomer is Libraries Thriving, which Sweet describes as an online community “dedicated to communicating the value of libraries and their ability to impact the learning moment.” This collaborative platform for e-resource innovation is all about thinking, doing, and sharing ideas, says Sweet. As part of Libraries Thriving, Credo added a Spring Seminar Series that covers key technical issues each month, from innovating on a budget to radical cost savings in library technology deployment. Credo keeps pace with the needs of its customers through communications with its corporate and librarian advisory boards, its sales and marketing team, and librarians who discuss their current pain points. Sweet says the Credo team of 25 core employees looks for the potential for value and finding what works the best. “Sometimes it’s just a matter of what form the content is in,” says Sweet. “Sometimes you just have to put it in a different form” to make products easy to use and ubiquitous. He uses the tablet as a perfect example. Though Microsoft created the tablet about 10 years ago, it took 10 years to get it right, he says. Apple stepped in and tweaked the form, and the iPad was born. “Imagine 10 years ago, if someone had said, ‘I guess we don’t need tablets,’ then we wouldn’t have the iPad,” he says. Credo bills itself as “publisher-neutral” in that topic-specific information percolates up from a variety of publishers. Most students actually think of the platform as one big librarian-devised encyclopedia, says Sweet. “It’s one platform for many publishers.” Credo’s Publisher Collections can augment an individual library collection seamlessly with deep subject-specific content, which can be added as a stand-alone purchase option or as a complement to a Credo subscription. With ongoing belt-tightening and budget trimming in libraries, Sweet says he realizes the extent of the financial pressures that libraries are facing and stands up to the challenge of providing the most value possible. “We say we realize that it may be hard to spend more dollars with us, but we value the dollars you have spent and will spend, plus, it’s just good business,” he says. “We stand by them, and they stand by us.” And since growth doubled last year and the rate is expected to double again this year, Credo is serving the needs of its customer base very well. Credo Reference was originally launched under the name Xrefer in 1999, the brainchild of Adam Hodgkin. In 2001, Béla Hatvany became a large investor and refocused it on the library space. Ever the entrepreneur, Hatvany previously founded SilverPlatter Information, Inc. (with Walt Winshall) in 1983, which was later sold to Wolters Kluwer in 2001. Sweet joined Xrefer as CFO in 2006, after serving as CFO and COO of CoreWeb, a web software and consulting company. Before that, he spent 7 years at Global Insight as business development manager, consulting for Fortune 500 companies. This self-proclaimed “numbers guy” earned his master’s in business administration from Babson College with a focus on finance and entrepreneurship and knows what it takes to move mountains in the enterprise world. The name Xrefer just wasn’t working, says Sweet. Everyone mispronounced it (actually, the correct pronunciation is “ex-refer”), and it always appeared near the end of the alphabetical library database listings. Credo worked with the in-house staff and an outside marketing firm on the name change and rebranding strategy in 2007; the result was Credo Reference. With Sweet on board, John Dove switched from CEO to president. The switch in the titles gave Dove more time to put his extensive experience in technology businesses (electronic publishing and online education) to work in the reference sector. Early in his career, Dove joined a Wall Street startup in 1968 that produced the first end user-accessible online database of stock market information. After that, he was president and COO of SilverPlatter and COO of GlobaLearn. He also worked on the Executive Education on E-Government project at Harvard University’s Kennedy School of Government. The transition gave Dove time to think about the strategic positioning of publishing partners and content development. “He has a natural curiosity to figure out what is the best content, what libraries want, what our advisory boards are saying,” says Sweet. “He digs into that with zeal. That’s his sweet spot.” As a result of these efforts, librarians have more choices, and publishers value those options too. Credo faced the economic downturn head-on. 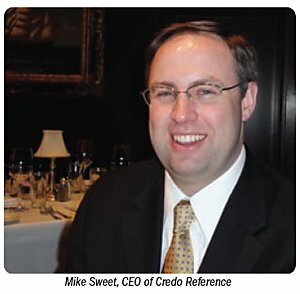 Sweet saw Credo as better positioned in the marketplace compared to other segments in the information industry because the company didn’t have a print legacy. “It may have looked like a short-term weakness at the start in 1999, but the company founders went to XML right away,” says Sweet. “When other companies were making the transition from print to PDFs, Hodgkin and his team saw the intrinsic value of XML and the ability to mark up content, all the content. Our content is branded as one big encyclopedia.” But in comparison to print, starting off with XML was incredibly costly. “It took one editor one month to do one book,” he says, “and that didn’t even count the cost of the work that needed to be done offshore.” But yes, the effort was well worth the investment. For Sweet, Credo is holding its own as a big player in the reference space and sees XML as the chief differentiator on the product side along with the platform. “We’re 100% focused on reference,” he says, which is “an absolutely critical first layer into the rest of the library.” And that’s what reference was always designed to do. Reference may not be as deep and robust as other library e-resources, but it makes the Credo team think even more broadly about how reference is used by librarians and the entire academic environment.